We may not think much about it, but homes shrink and expand. Oddly enough, they move, they settle, they change with the seasons. 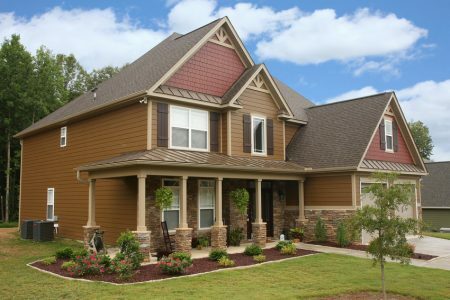 If your home is clad in wood or wood-based siding, such as LP® SmartSide®, it can expand when exposed to humid air, and contract in drier air conditions. Also, the expansion or contraction of wood-based siding doesn’t move in all directions equally, in fact, the greatest movement will always be along the length of the board. When installing LP SmartSide, contractors are required to install with a 3/16-inch gap between each board, to allow for any movement of the boards, but also makes the home more vulnerable to significant moisture issues, if this joint is not properly maintained. James Hardie® building products on the other hand, are engineered for less shrinking and expansion with temperature and humidity changes. All James Hardie siding products are Engineered for Climate® and the HardieZone® System entails climate specific product formulations for distinct climate zones. Whether it’s the hot beating sun or an epic mound of snow, the HardieZone® system has your home exterior protected. The southern-specific HZ10® products protect homes from heat, humidity, blistering sun, and the northern-specific HZ5® products are made to resist wet, freezing conditions. It’s reassuring as a Midwest homeowner to know that James Hardie siding and trim can stand strong in any extreme weather or climate shifts that comes its way. Wood and wood-based siding swells and shrinks, but you can resist this better with the more stable option—James Hardie siding and trim.